SYDNEY (AP) Skipper Mile Jedinak has been recalled to Australia’s squad for the first time since June to prepare for next month’s World Cup intercontinental playoff against Honduras. 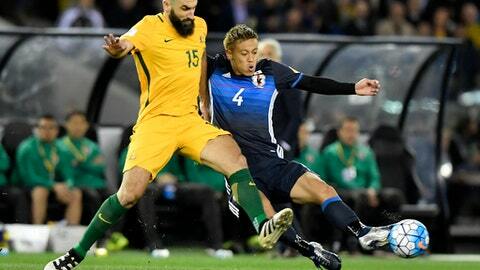 The 33-year-old Jedinak was injured and missed the Asian playoff win over Syria which earned the Socceroos a spot in the last-ditch, home-and-away series against Honduras for a place at next year’s World Cup in Russia. His return for Aston Villa last weekend in England was enough to earn a spot in the 25-man squad announced by Australia coach Ange Postecoglou on Tuesday. Mark Milligan and Mathew Leckie, who are suspended for the opening match in San Pedro Sula on Nov. 10, were also included in the squad. The return match will be in Sydney in Nov. 15. Tim Cahill, who scored two crucial goals in Australia’s come-from-behind win over Syria in the return leg of the Asian playoff, is again expected to feature heavily. He has been a part of Australia’s squad at the last three World Cups. Postecoglou has come under increasing pressure as his Asian Cup winning-squad struggled to score goals in the last round of Asian qualifying, and missed out on an automatic spot at Russia on goal difference to Saudi Arabia despite only losing one of their 10 games. The Australians again struggled to convert a glut of possession into goals in the first half of the opening playoff game against Syria, which scored a late equalizer to compound the pressure going into the return leg. A newspaper report following that series implied Postecoglou was ready to quit after the Honduras series even if Australia qualified for the World Cup. Speculation about his coaching future has only heightened with the coach refusing to comment on anything beyond the playoff with Honduras. ”I’m happy to have that discussion when we qualify,” Postecoglou, who is contracted until the end of the World Cup cycle, told a news conference in Sydney. ”If we don’t qualify … my future is absolutely certain. The Australian squad will start assembling in Honduras on Nov. 5. Goalkeepers: Mitchell Langerak, Mat Ryan, Danny Vukovic. Defenders: Aziz Behich, Milos Degenek, Alex Gersbach, Matthew Jurman, Ryan McGowan, Josh Risdon, Trent Sainsbury, Bailey Wright. Midfielders: Craig Goodwin, Jackson Irvine, Mile Jedinak, James Jeggo, Massimo Luongo, Mark Milligan, Aaron Mooy, Tom Rogic, James Troisi. Attackers: Tim Cahill, Tomi Juric, Robbie Kruse, Mathew Leckie, Nikita Rukavytsya.